Sometimes it's fun to think back on the tangled history you've had with a particular book. It's almost like thinking back on a relationship, for good or ill or a combination of both, that you've had with a person. 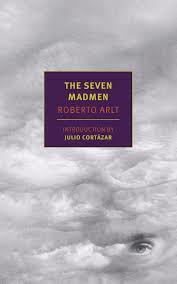 One book I go back a long way with is Roberto Arlt's novel, The Seven Madmen. I discovered it in college while reading Jorge Luis Borges. Arlt lived most of his short life (1900-1942) in Buenos Aires, and Borges talks about him in some of his essays. 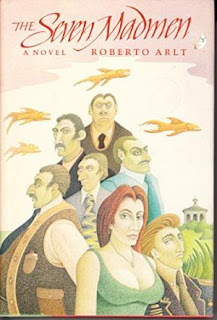 After starting with Borges, I got into a number of Argentinian writers while in college - Julio Cortazar, Ernesto Sabato, and Manuel Puig to name a few - and one reason, obviously, is because I could find these writers in translation either in books then in print or out of print but in used bookstores or in the school library. Arlt's novel, published in 1929, praised as a rough, violent, surrealistic look at life among the underclass in late1920's Buenos Aires, seemed like something completely unlike the other Argentinians I was reading. Piece after piece I read by or about Argentinian fiction cited its huge influence on the country's lit. "Have to read this," I told myself, quite excited, only to discover that The Seven Madmen had never been translated into English. Okay, I couldn't do anything about that. I figured I'd have to forget about reading The Seven Madmen. Then, very soon after I graduated from college, I was browsing in a Manhattan bookstore (B Dalton, a chain that no longer exists) and what did I see in the new novels section but a stack of Roberto Arlt's book, in hardcover. I was thrilled, but I had little money on me and no credit card. I let the buying opportunity pass, figuring I'd return soon and purchase the book. Needless to say, I didn't make it back to that bookstore anytime soon, and when I did, with money in my pocket, I couldn't find The Seven Madmen. The book didn't come out in paperback here, nor, as I remember, did I ever see it in a library or a used bookstore. This is, I should add, before Amazon and before the Advanced Book Exchange; libraries and bookstores were about the only places to find a book you were looking for. A few more years went by, and every now and then, I'd shake my head in annoyance at myself for not having parted with the money when I had the chance to buy Arlt's novel. If I'd wanted it so much, why had I been so cheap? Was being almost broke an excuse? Now it was possible that I'd never get to read The Seven Madmen, and I would have to content myself with reading other writers talking about it. Could I learn Spanish just to read it? I doubted it. I've never been good at learning languages and knew myself well enough to know I never would be. Then, in the mid-nineties, more than a decade after I'd left college, the Advanced Book Exchange came into being. I think it was my father who told me about it. Hard to believe now, but the idea that you could go online and search for a book and be connected to hundreds of used bookstores around the world seemed incredible. I tried it out and found that my father hadn't been exaggerating. But still, I thought, let me put this thing to the test. Let's see if this ABE is as advertised. Can I find The Seven Madmen? Why I put it in a box in my closet where I had piles of other unread books I intended to read I can't quite say, but as a matter of fact, once I had The Seven Madmen, once the joy of actually having it in my possession wore off, I lost a lot of my desire to read it. It sat in my closet with the unread books another ten or eleven years. Sometimes I'd say to myself, "You should read The Seven Madmen. Come on. It's there, it's waiting. Borges says it's good. And Cortazar. And so many others. How could it not be? What's keeping you?" Then I'd think that after so long a time looking forward to reading it, the novel would not meet my expectations. You can look it up yourself. It's there for the taking and it's instantly available. But every time I think about The Seven Madmen or look at it sitting on my shelf (now that it's made it out of that box), I'm reminded of my history with it and how long it took me to find my way to reading it. We've been through a lot, that book and I. Guys, it's not her, it's you.